We see people struggle with camping hammock set up a lot. You buy a brand new hammock, it finally arrives, and you’re excited to try it out. You tear open the packaging to find carabiners, ropes, hooks and all sorts of gadgets. And then you wonder, “What do I do with all of these pieces?” Or if you’re me, you just do it wrong and fall out of the hammock! With Serac ultralight camping hammocks, we make setup as simple as it can possibly be. Do I need to learn how to tie knots? Learning how to tie knots is always an important survival skill to have out in the wild regardless of your intended activity. There are some knots that work really well for hammocks – but these can get complex, and when you’re just finishing up an intense day on the trail, knots are the last thing you want to think about. There’s also the added concern of making sure your knots are strong and stable; if they are not sturdy enough, you might be in for an unpleasant surprise when your hammock falls down in the middle of the night. That’s why we decided it was time to try something a little less complicated. 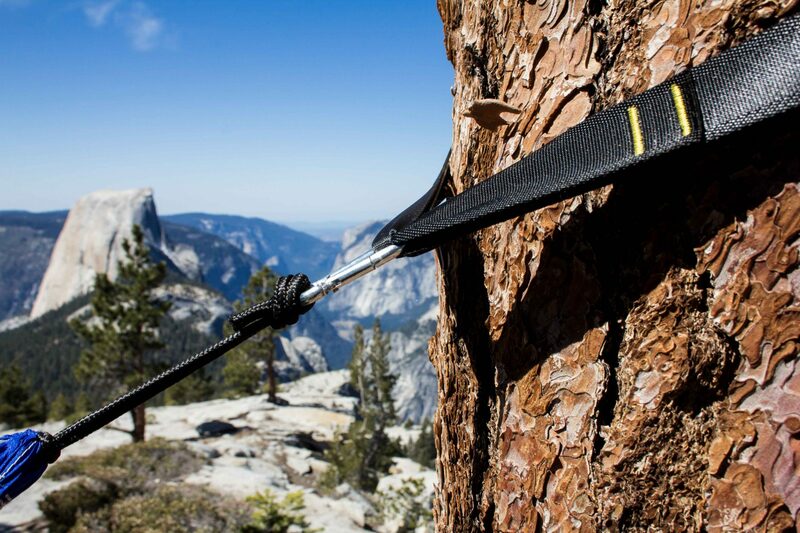 With our 10 anchor Tree Hugger straps, you don’t have to worry about knots. Our 6 foot long straps come with 10 loops that serve as anchor points for the hammock carabiners. Wrap the Tree Huggers around the tree and pass one end of the strap through the last loop on the other end. Tighten the strap around the tree. Clip your carabiner onto the protruding end, and you’re all set. The whole process can be done in thirty seconds, whether you’re brand new to hammock camping or seasoned professional. How far apart do the trees have to be? We typically recommend the trees be somewhere around 14-17 feet apart, but this will largely depend on the size of the trees. Wider trees will take up more of your Tree Huggers and leave you with fewer anchor points and less flexibility. In this case, you’ll want to find a set of trees that are closer together. Skinnier trees allow more anchor points and more strap length to be used, so you have more options for set up. How far off the ground should I be? After getting into the hammock, you’ll want to be off the ground but at a safe height. In the unlikely chance that you’ll fall, you don’t want to be situated too high up. The ideal height is somewhere around 12-18 inches off the ground. Attach the Tree Hugger straps to the tree about 5-6 feet off the ground. Aim for a 30 degree angle between the tree and the hammock line to give your hammock some slack. This will allow you to properly lay in your hammock without it being too taut for comfort. How do I lay in it? Contrary to what many might think, you’ll want to lay in your hammock diagonally if you plan to sleep in it for the night – not parallel with the hammock. Sleeping diagonally allows your body to stay flat throughout the night for maximum comfort and ergonomic posture. 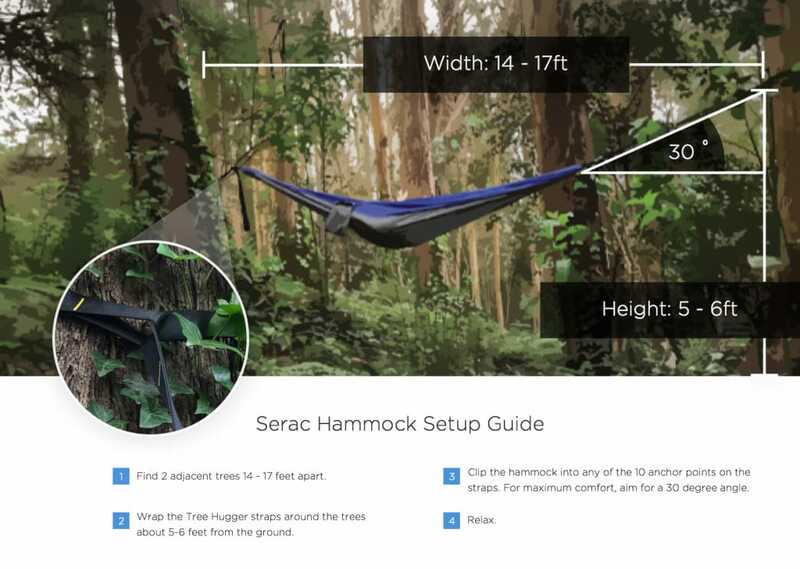 With Serac ultralight hammocks, setup is simply effortless. There is no need to struggle with complicated suspension straps anymore – no knots, no nonsense. Intuitive Tree Hugger designs protects our trees so you can relax with nature. Have a comfortable space to relax ready in seconds, and rest assured that you’ll be off the ground, safe and sound. 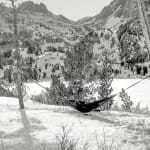 This entry was posted in How to, Setup and tagged Guide, hammock, Setup, Ultralight Hammock. 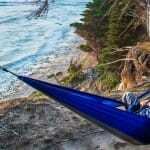 I have a similar parachute hammock that I’ve been using for the past few months. I’ve been setting it up properly (I think!) but have been having trouble getting into a comfortable diagonal position. Throughout the night, I always find myself back in a parallel kind of position with my hammock. Do you have any advice on how to fix that or why it’s happening?